A red sandstone polygonal tomb on an extended rectangular platform with corner cupolas, probably at Firozabad. bl.uk > Online Gallery Home	> Online exhibitions	> Asia, Pacific and Africa Collections	> A red sandstone polygonal tomb on an extended rectangular platform with corner cupolas, probably at Firozabad. 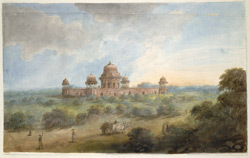 Watercolour of a tomb possibly at Firozabad from 'Views by Seeta Ram from Agra to Barrackpore Vol. X' produced for Lord Moira, afterwards the Marquess of Hastings, by Sita Ram between 1814-15. Marquess of Hastings, the Governor-General of Bengal and the Commander-in-Chief (r. 1813-23), was accompanied by artist Sita Ram (flourished c.1810-22) to illustrate his journey from Calcutta to Delhi between 1814-15.